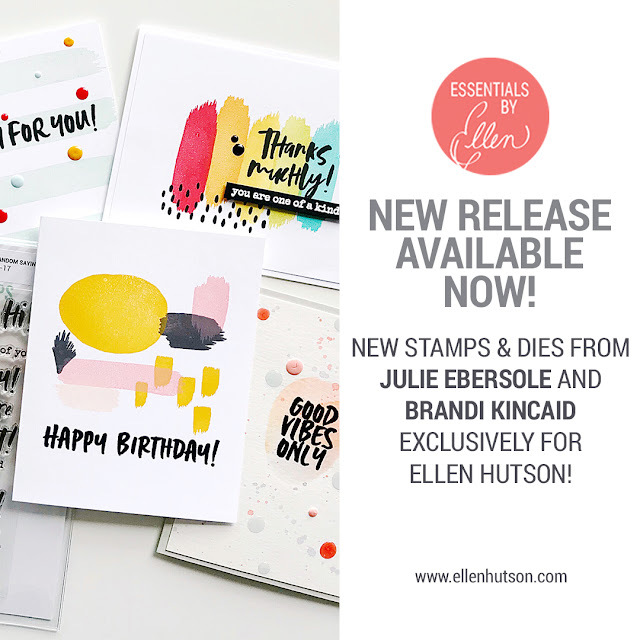 carly tee: hopping with ellen hutson! I love this time of the month - new Essentials by Ellen! It's like a little bit of Christmas at the beginning of each month!!! I love how the ladies look so sweet together and how when stamped off the edge, it's like they are leaning in to say hi and remind you that "you are loved". Photo Lady, Cozy Lady and Crafty Lady make great buddies! And Julie's new Abstract Paint Strokes is the perfect background for a sweet sentiment like this one from the new Totally Random Sayings Vol. 1. I think "you are loved" will be appearing on a lot of my upcoming projects. We all need a little more love right?! Ok, I'll stop chattering. You're next stop if Carolyn's blog. Have fun hopping along! Great idea to use the Ladies leaning in to say whatever sentiment you want! Clean and fairly quick (speaking for myself)🤔. Thank you for another way to use Ellen’s adorable stamps! These are really cute stamps and look like a lot of fun to put some cards together! Sentiment . . . You are loved. That is what everyone wants to hear! Absolutely so sweet and I love how you used all the new sets and yet kept your design CAS. Excellent in my book! Your cards are so lovely ! Yours cards are fantastic, Happy to find your blog, while doing the blog hop! I just love how the girls are popping in from the sides! Great idea! Soooo cute! TFS! I just love how you designed these cards Carly!! It's so pretty and creative!!! Darling cards. Love the stamped images. Thanks for sharing. I love these stamps, oh I hope I can get hold of them here in the UK.